We woke to a glorious sunrise and a flat sea this morning. Autosub6000 needed to be recovered at the end of its mission, so we headed to our rendezvous point and brought it safely on deck. With a few minor repairs, and recharge of the batteries, the sub was ready for yet another mission tonight. We caught up with Pete, Autosub6000's mechanical engineer, to find out what needs to be considered when designing an underwater vehicle. Pete has been involved with the Autosub series of vehicles since their early development in the 1990s. These Autonomous Underwater Vehicles (AUVs) differ from remotely-operated vehicles such as HyBIS in many ways, most notably their use of power. 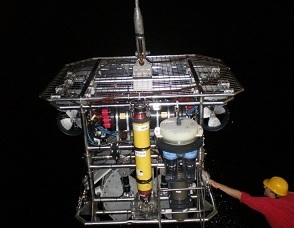 Remotely-operated vehicles usually draw their power directly from the ship via their umbilical cable, but free-swimming AUVs such as Autosub6000 are powered by their own on-board rechargeable batteries. This is where the role of the mechanical engineering comes into their design: with a 'budget' of 500 watts of power, streamlining the vehicle allows it to travel further on less power. Every movement needs power, so smooth lines and fine tuning of the propellers and rudders help the submarine to achieve longer missions. 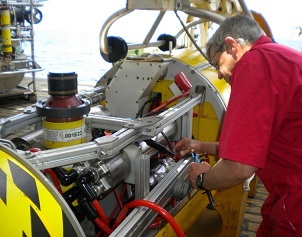 The buoyancy materials used in Autosub6000 are also moulded and pressurised when fitted, but their buoyancy changes during each mission, requiring the vehicle to be 'trimmed' by changing the position of lead weights used for ballast. The submarine also has to cope with the challenge of water pressure: at 5000 metres deep, the pressure is more than half a tonne per square centimetre - roughly equivalent to the weight of a hippopotamus on an area the size of a postage stamp. Pete was involved in the design of the pressure housings for all the electronics, choosing titanium for its high strength and anti-corrosive properties. 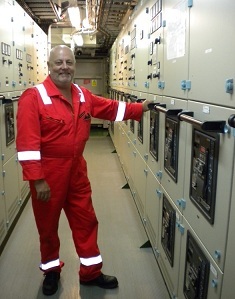 On the subject of power, we had a chat with Steve, the ship's electrical engineer, to find out how he works closely with Mick Myers, Sea Systems Engineer, to look after the electrical supply for the ship. It's a big responsibility for one person to make sure that electricity flows smoothly to all the ship's, scientists' and domestic systems. Prevention is the watchword at sea, where something as small as a fault in a washing machine will have more significance than on land - so a careful routine of maintenance is required. The biggest challenge of the day was untangling the cable used for HyBIS. Gradually over its dives, the cable attached to HyBIS has become twisted, with each turn by HyBIS adding another twist, rather like the tangles in a telephone cord. 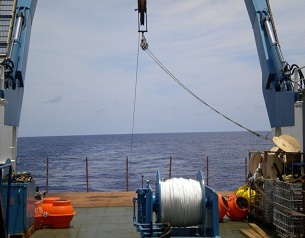 To straighten the cable, we had to pay it out from the winch while slowly moving the ship. At one time, we had 9199 metres (around six miles) of cable streaming out behind us. The untangling took around eight hours, which delayed us from deploying our second mooring - a job for tomorrow.